This from Yokohama Sea Paradise water tunnel. 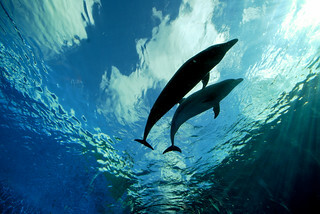 A dolphin couple passing by, shot taken from underneath with a Sigma 10-20, most likely at 10 mm. My 10th photo on explore and frontpage (#22 at best) at that, thanks everyone! Just learnt a lesson about Explore! This photo was doing fine until I started accepting 5-6 invitations to post the photo in "invited" groups that require comments. Instantly after posting to these groups the photo disappeared from the Explore radar! Thus, if you reach a nice position, resist those invitations if you want to remain.